This is a newer book, which I just added to my miniaturist book collection. I've skimmed through this book twice already, and read through once. The author uses lots of photos of finished houses, the house before it is built and then, afterwards, with it completely furnished. Info about each house is also included with tips and advice. The book is broken down into four parts. 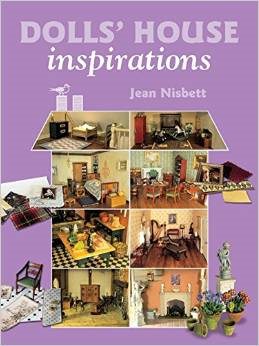 The author covers Period houses, European Houses, gardens and garden buildings and practical advice. The Georgian House, in particular is a work to be admired. An ostentious work with it being over 7ft high and 5ft wide and 5ft deep, it took the retired couple who designed it seven years to build. I can only imagine how much it cost to construct. The only caveat I have about this book is that everything that is made in this book is from a kit, and not from scratch. It does a fine job of inspiring one to begin, or move along with a miniature project, but does nothing at motivating one with ideas from scratch. Modern miniaturists are ready to tackle a wider and more challenging range of projects than ever before. Whether you are a collector who wants a fully furnished doll’s house, a miniaturist who wants a ready-made house to decorate, or a hobbyist who wants to make a house from a kit, you’ll find a huge variety of exciting projects and ideas here—from Tudor designs, to a Georgian mansion; from a French farmhouse, to a 17th century Dutch home. Outdoors enthusiasts are not forgotten either, with whole sections on gardens, and garden buildings, such as an orangery and a summerhouse. Illustrated throughout with lavish color photography, this beautifully realized source of inspiration is sure to provide many hours of pleasure.